With Spec Search, you can search a product’s specifications in addition to the model number, manufacturer, brand, category and properties. This is useful when trying to match your customer’s material, design and finish needs. The Spec Search button is located on the top ribbon of the Catalog screen. 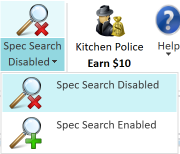 By default, Spec Search is disabled. Click on the drop-down to enable the feature. Now, when you enter a search term, the search will also look at the Specifications section of a product in addition to the model number, manufacturer, brand, category and properties. Let’s look at an example to show you the power of Spec Search. Let’s say the front-of-house motif of your customer’s restaurant is brass, and they’re looking for brass mugs. In these results, 20 products are returned, including the two Brasserie mugs from the first search. The 18 new results all have either a brass handle or brass finish. We hope that as you use Spec Search, you find that it’s a powerful tool for locating the exact product that matches your customer’s unique needs.